I began hunting for the cheapest water color paint set i could find, while sticking to the Crayola brand, as i have loved that brand since a child. Nothing worked better than Crayola for me. Not Roseart, store brand, etc. I was an absolute Crayola fanatic as a child. Thinking back, i have always loved art and creating things. 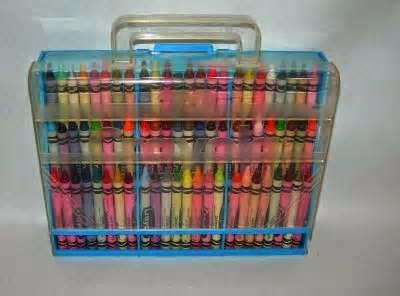 Any who, i remember having the big, almost briefcase looking, crayon holder. Anyone else have one of those as a kid? PLEASE do share if you have. This briefcase contraption looked very much like the one (i found via google) below. I have never worked with watercolor paints on the nails so i didnt have a technique to go off. SORRY folks. It was a trial and error kind of thing. EACH nail was painted 2 coats of white polish and let to dry BEFORE attempting water color on them. This is a MUST unless you want a big smeary mess. The picture above is some of my favorite designs using the Crayola water color paints. So, what do you guys think?Are you tempted to try watercolor nail art too?